A small but select few turned up to dig last Sunday, on a grey miserable looking day. 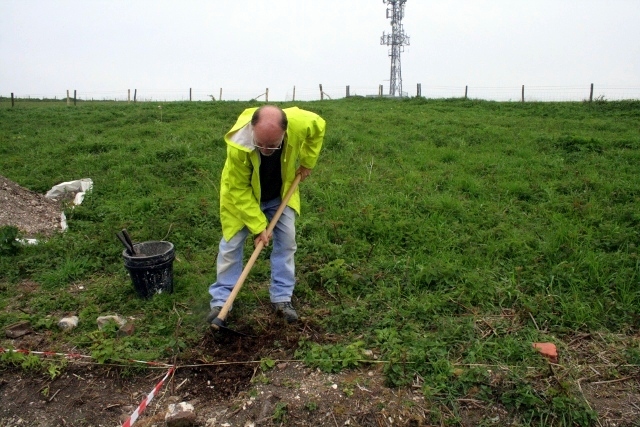 Fortunately the weather cleared up and we had a good day’s digging. Starting trench 2 over water-pipe in farmyard. Half of us opened a new 1m wide trench to investigate a metal pipe which had been found at the base of the demolition layer in front of the house. I had tracked its probable but faint course with a metal detector across the farmyard towards the corner of a former big barn which had contained a large water-tank. 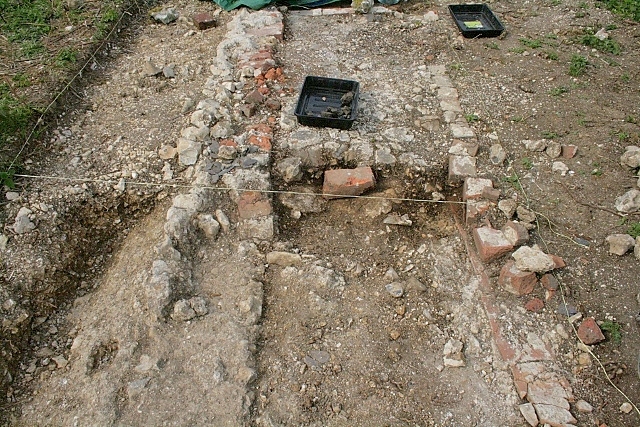 Initial excavation indicates the pipe is definitely in-situ and hasn’t just fallen from the side of the house. 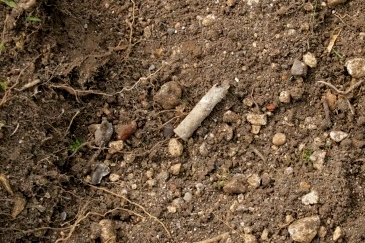 A badly corroded .303 cartridge was found in the demolition rubble of the trench. The circlular firing pin indent in its base indicates it was fired by a rifle. 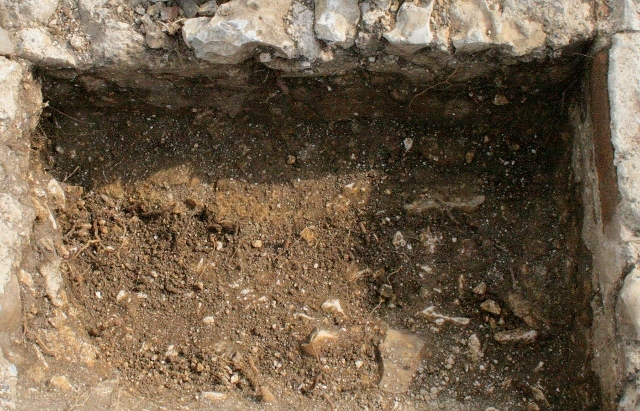 Towards the other end of the house, excavation continued in a probable built-in cupboard, adjacent to the ‘coal cupboard’. Excavation revealed that the mortar floor of the coal cupboard had been cut by either WW2 ordnance, later bulldozer, or both, at its southern end. A single brick which sat on top of the edge of this feature may or may not have marked a dividing wall between cupboards. Amongst some medium sized pieces of coal, right in the corner of the coal cupboard, our 2nd small plastic bead was found – black with 8 small facets round its middle. It was most likely made of bakelte, though I have yet to test the bead as yet. If I heat it – by vigorous rubbing – it should smell of formaldehyde. If it is, it will date to somewhere between 1909 and 1942 when the house ceased to be occupied. Bakelite jewelry was most popular in the late 1930’s – and was very much part of the Art Deco movement. Though some high end fashion houses used it, bakelite was very cheap to manufacture, and so may even have been affordable by the poor residents of Newmarket Farm. By contrast, the Lucite bead, which was found earlier in the dig, was made by one of the top fashion houses in the world and so was most likely to have been an extremely expensive gift. Foundations of inside of old SW corner of house. At the other end of this ‘cupboard’, a small sondage down to the mortar foundations on the inside of the original SW corner of the house, revealed only a narrow bed of mortar. This contrasted with the steep sided wide wedge of mortar on the exterior of the west wall. This was probably to butress the base of the house wall – to anchor it in place.